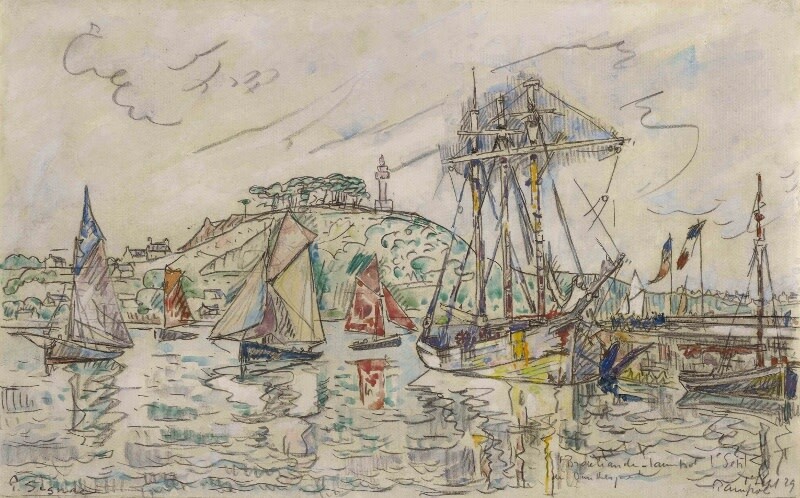 Paul Signac was an avid sailor and owned over thirty boats during his lifetime. In 1929 a commission from the French businessman Gaston Lévy provided Signac with the means to undertake a series of watercolours devoted to the ports of France. While Signac estimated the journey would only take a few months, the project took over two years and resulted in countless studies of the dazzling effects of colour and light upon water. This idyllic scene of the port of Paimpol was made on the coast of Brittany in the late summer of 1929. In this large watercolour, Signac fills his composition with the recurring motifs of boats, cloud-filled skies, rippling water and human onlookers engaged in a flurry of activity. At the heart of this painting is Signac’s affectionate rendering of the titular ‘Le Brocéliande’ ship and other sailing boats which came to Paimpol to be prepared for deep-see fishing. This work is characteristic of the highly personal watercolour style Signac developed whilst painting ‘en plein air’. It was Camille Pissarro that first encouraged Signac to take up watercolour in 1888, explaining: “in just a few minutes you can take notes that would be impossible by other means- the fluidity of a sky, some transparent effects, a mass of small pieces of information that cannot be conveyed working slowly: effects are so fleeting”. Signac quickly recognised that this medium enabled him to capture “the wind, the tide, the current, and the sails”. In this series of dynamic watercolours Signac adapts the structure and use of colour from his earlier Pointillist work to create a truly modern form. Like Turner and Cezanne, Signac deliberately left pencil marks visible, but contrasted these controlled lines with intuitive dabs of pure colour to bring his scenes to life.